Quite a full house at Todders, as Fred & Ray had abandoned the siphon and come to see if they could help here. They were set on cleaning the rods on the RHS. Tricky doing the LHS, as they are all off. In fact, John G was painting the backs of these rods. There was such a shine on the gloss black, that my eyeballs got confused, and thought he’d painted the entire rod! But he hadn’t, it was just the reflection. So, Fred & Ray continued cleaning up the wheels, painting the rims and the bosses, in particular. The slide bar hanging bracket had a coat of paint, too. John G moved on to cleaning and gloss painting the tender rear brake hangers with their new guard irons. Then the gauge frame received a coat of gloss. Finally, John found a boot scraper that needed a top coat (of green, for a change!). Gil, Bruce and David spent quite some time investigating options for improving the lubrication at the front of the valves. There are several options - this valve rod has sleeves at each end, for example. The workshop was not able to make new brass bushes for our gradient pins, so Gil has arranged to get them made externally. Bruce made a start on cleaning the injectors’ internal parts. He also found in our container what appear to be the open-ended alternative style of valve rod covers as seen last time on the 38xx. Why have we got these, I wonder? Did we just “randomly” acquire them? Did someone plan on modifying 2807’s valve rod covers at one time? David replaced one of the driving wheel axle dust covers and fitted new felts. However, the felts are not large enough, and will drop out when the wheel rotates! So, he’s not happy about the way these (don’t) work, and will cogitate upon it. Another little job was to flatten the gradient pin end caps, which had become dished. I think there might be a need for a spacing washer in the rod forks. John T pressed out the bush from one of the valve cylinder end covers for inspection. 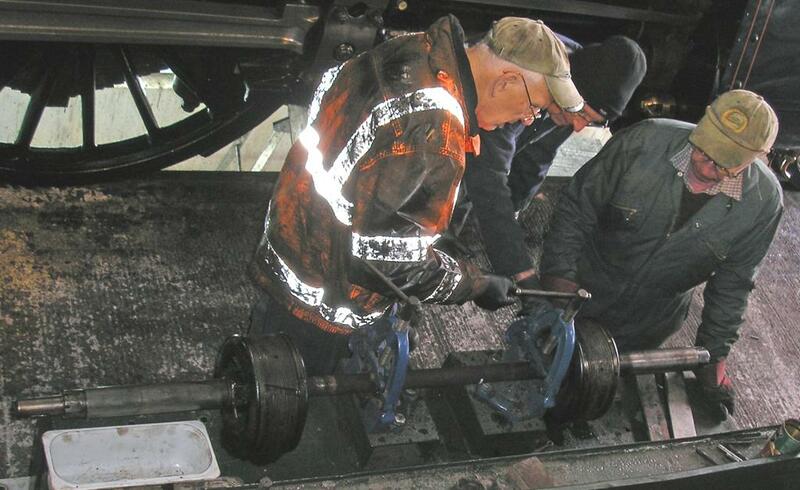 He refitted plate-work on the front running board, in anticipation of feet needing to tread on them on Saturday. After doing these, John decided to needle-gun another four rail chairs, to keep the production line moving. 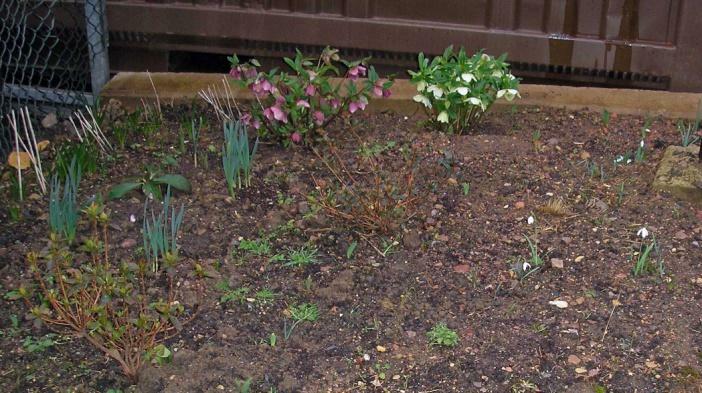 John T was ‘into’ gardening today, beginning by trimming dead leaves from the hellebores in the 2807 Flower Garden. 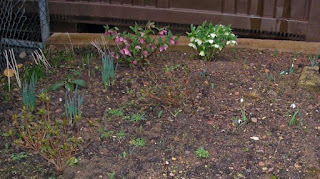 Apart from the small shrubs (hellebores and azaleas) there is a variety of bulbs popping up - snowdrops, daffodils and bluebells in particular. Later in the day, John, Fred and I played with the poppy. 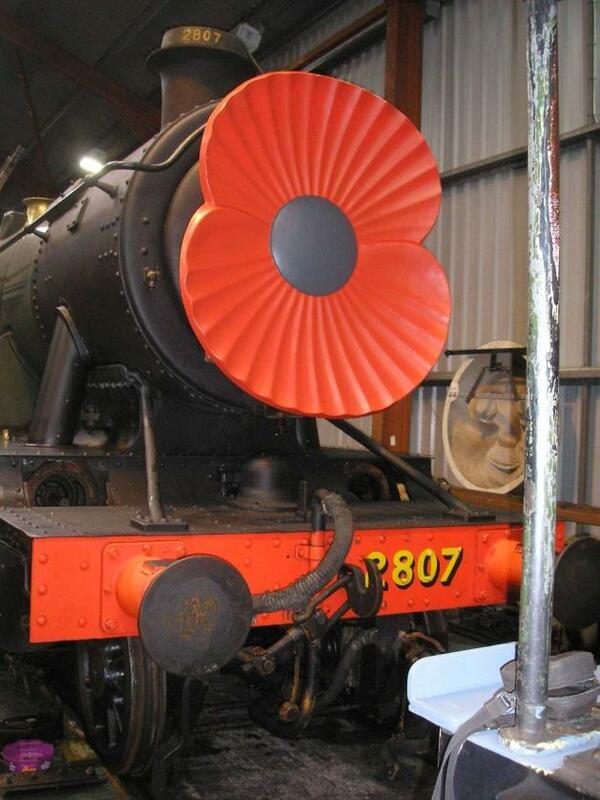 Well, you possibly fit a poppy to your car in November, so why shouldn’t we fit one to 2807? After all, 2807 was working on Armistice Day 1918 and had been hauling coal from South Wales to Warrington (on its way to the fleet anchored at Scapa Flow). 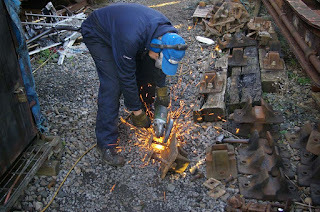 Chaps in the Loco Dept had fabricated a frame, so we tested it all out today. Hardly a streamlined, airsmoothed front end, but hey-ho! I suppose we ought to test it out by going out for a surreptitious run when no one is looking! Note the strange “face” visible to the right. That is actually the blank reverse of one of those Thomas style faces … so what caused it to reflect light in that weird way? Spooky! John and Fred spent much of the day cleaning the running boards. Fred managed to find a few loose bolts. However, being round-headed they are a challenge to tighten. Gripping their head firmly in the mole grips is your only hope. Gilbert had one of the brass bushes for the coupling rod. It seems to be a good fit for the rod, but the old gradient pin was too tight a fit. The new pin has not arrived yet. Gil & Bruce spent even more time debating the options for improving the lubrication of the front of the valve rods. 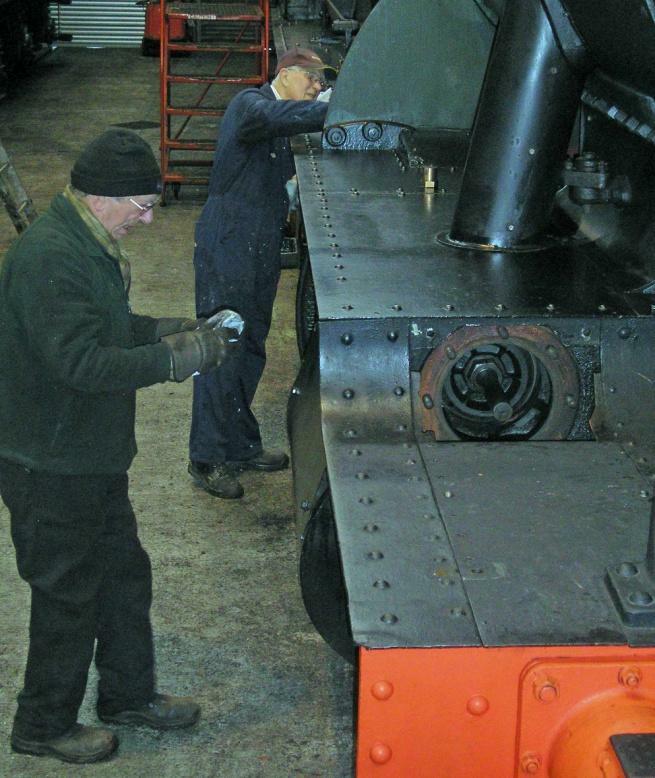 Will Naylor joined in, with his experience of other locos and modifications he’s seen. I think Gil has enough info now, to go away and detail the options. Colin from Riley & Son (E) Ltd came down from Bury to examine our boiler with a view to quoting for its overhaul in two years’ time. It was extremely interesting to hear some of his tales over tea break, not to mention his company’s track (pun intended) record. Amusingly, while probing inside the lower centre (throatplate) mud-hole, Colin found three old stays! Two of them look to have been inside there for a very long time! The recent wash-out must have dislodged them. Colin also had a look at the piece of boiler tube that blew a hole the other year. 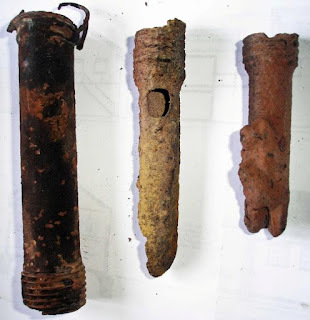 He said that he’d seen something like it before, and that it may have been caused by a drop of grease falling onto the tube through the steam valve assembly opening during its fitting. This made sense in that it was a tube from a top row and close to the centre. Grease could have created a hot spot, for example, and gradually caused the tube metal to fatigue. Bruce managed to do a little more cleaning on the injector internals, but was assisting with Colin for much of the morning. The insides of the injector bodies remain to be cleaned. Loco Dept coaled and watered our tender. We then pushed it up to the loco and (using our unique and not-patented gadget) lined up and connected the outer two links. It was surprising how easy it is to move our tender. Bruce started it with a pinch-bar, but once static friction had been overcome, it was easy for a couple of us to keep it rolling. One boot scraper sold; one parcelled up for collection on Sunday, and Graham’s one finished ready for his next visit.